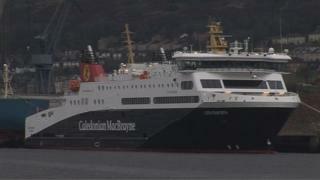 Image caption Bu chòir gun robh an MV Loch Seaforth ann an seirbheis eadar Steòrnabhagh agus Ulapul bho chionn sia mìosan. Thàinig dearbhadh bho Chaledonian Mac a' Bhriuthainn gum bi e comasach do luchd-siubhail àite a ghlèidheadh air aiseagan as t-Samhradh eadar Steòrnabhagh agus Ulapul bho fheasgair Diciadain. Cha robh e comasach do dhaoine sin a dhèanamh gu ruige seo air sgàth na mì-chinnt a bha a' cuairteachadh a' bhàt-aiseig ùir an MV Loch Seaforth. Anns na beagan làithean a dh'fhalbh tha buidhnean bathair agus buidhnean turasachd anns na h-eileanan air a bhith a' gearain mu staid na seirbheis-aiseig eadar Steòrnabhagh agus Ulapul. Bha còir aig a' bhàt-aiseig ùr a bhith ann an seirbheis bho chionn sia mìosan, agus tha obair a bharrachd air cidhe Ulapuil sa Ghiblean a' ciallachadh nach bi aiseag ann airson chàraichean airson còig seachdainnean. Bha na buidheannan turasachd gu h-àraid mì-thoilichte nach robh siostam airson àite a ghlèidheadh air a' bhàta fosgailte airson an t-Samhraidh. Bha iad a' dèanamh a-mach gun robh call luchd-turais air tighinn orra mar thà air sgàth sin. Tha Calmac a-nis air dearbhadh gun urrainn do luchd-siubhail àite a ghlèidheadh air bàtaichean an t-Samhraidh air-loidhne bho fheasgair Diciadain 21mh am Faoilleach. Thuirt iad cuideachd gun robh e cudromach tuigsinn gum biodh an MV Isle of Lewis air a cumail ann an Steòrnabhagh airson greis airson cuideachadhadh a thoirt don Loch Seaforth 's i a' fàs cleachdte ris an t-seirbheis.